With advances in surgical techniques and greater understanding of immunosuppressive management, abdominal transplants are becoming a more widespread definitive treatment for otherwise end-stage diseases. The most common abdominal transplants include hepatic, renal, pancreatic, and islet-cell transplants. 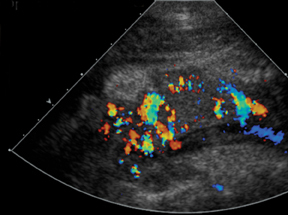 Implementing ultrasound as a diagnostic tool in the immediate post- and perioperative periods provides an accurate assessment of allograft viability that obviates the need for additional exams, which could subject the patient to unnecessary radiation and contrast exposure or the risks of invasive procedures. 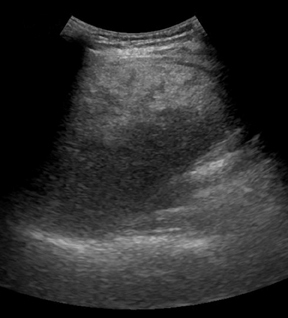 Approximately 6,000 hepatic transplants are performed annually in the United States (U.S.) and, as of December 2011, > 16,000 patients were awaiting transplantation.1 Postoperative ultrasound evaluation can accurately and effectively detect complications that will affect long-term morbidity and mortality. With increasing demand for liver transplants and for reduction of wait-list mortality rates, the available donorpool has been expanded by the advent of the split-liver transplant technique from cadaveric donors and lobar (right or left) grafts from living related donors in addition to whole liver transplants. It is imperative to recognize and understand the anatomy, variant anatomy, and functionality of these special cases. Split-liver transplants increase the recipient pool by dividing a donor liver between an adult and pediatric recipient. Adults most often receive the right lobe segments 5-8 (Figure 1). In larger patients, the medial segment of the left hepatic lobe may be included along with the right lobe (segments 4-8). 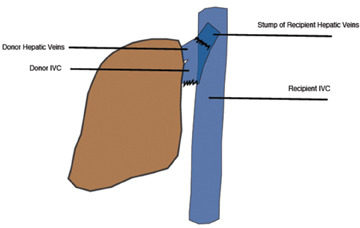 Pediatric recipients can then be transplanted with the remaining left hepatic lobe (segments 2-3 or 1-4).2 Split-liver transplants may employ vascular conduits and reconstruction, which increases the risk of postoperative complications.2 It is advisable to consult with the surgical team to better understand potentially complicated reconstruction anatomy. 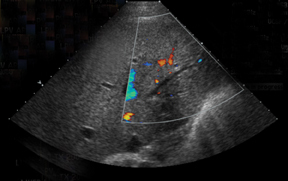 Sonographic evaluation of the hepatic allograft should begin with grayscale imaging of the type of transplant, transplant size, echotexture,and location within the abdomen. Special attention should be paid to the biliary tree. 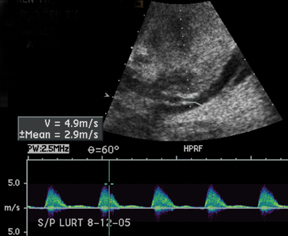 Routine Doppler interrogation of the hepatic vessels should include, when present, the main, right and left hepatic arteries and portal veins, as well as the middle, right, and left hepatic veins.Perihepatic collections are common in the immediate postoperative state, but should decrease over time and exhibit no mass effect to the hepatic parenchyma and vessels. 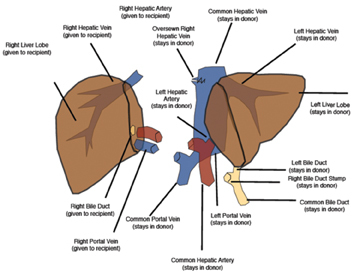 Understanding the anatomy or variant anatomy of the various types of hepatic transplants will help focus examination of the anastomotic channels as well as reveal the complications associated with each and prevent erroneous diagnoses. 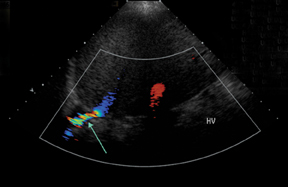 Approximately 50% of transplant recipients will endure a postoperative complication, 10% of those being vascular complications.3,4 With its accuracy in detecting hepatic artery complications in nearly 92% of cases,5 ultrasound becomes an essential and imperative diagnostic exam. Most often, the donor hepatic artery is anastomosed in an end-to-end fashion to the recipient hepatic artery or between the donor celiac axis and bifurcation points (right and left hepatic orGDA and PHA) of the recipient.2,6,7 A Carrel patch, an aortic patch containing the donor’s aorta, including the origin of the celiac axis, may also be used as an anastomotic channel.8 Oftentimes, a “fish mouth” anastomosis must be performed to overcome size discrepancy between a small-caliber donor artery and a larger-caliber recipient artery.7,8 Alternatively, an interposition graft, often using the donor’s iliac artery, may connect the donor hepatic artery to the recipient supraceliac or infrarenal aorta or other tributary.2,6,7 The discrepancy in size may increase the risk of hepatic artery complications, including stenosis and thrombosis, in the postoperative period, or it may mimic a pseudostenotic appearance.2 It is not uncommon to have the donor celiac artery anastomosed to the recipient hepatic artery at the bifurcation. IVC complications are rare, but include stenoses and thromboses at the anastomotic site, and occur more commonly in pediatric populations, retransplantation, and when end-to-end anastomoses rather than “piggyback” anastomoses were employed.2,8 Grayscale depiction of IVC stenosis, which more commonly occurs at the suprahepatic anastomosis, will demonstrate an area of focal narrowing and color aliasing.2,3 A hemodynamically significant stenosis will demonstrate a 3- to 4-fold increase in peak systolic velocity when compared to the prestenotic cava.2,8 Downstream intrahepatic venous waveforms will lose phasicity and demonstrate flattening of the normal triphasic waveform. 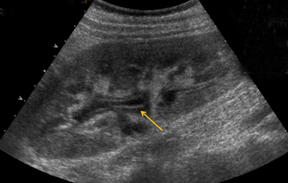 (Figure 4).3,8 In severe cases, there may be flow reversal in the intrahepatic veins.3,8 Pseudostenosis is often caused by kinking at the vascular pedicle and can mimic a hemodynamically significant stenosis; however, maneuvers such as scanning in expiration, or in the standing position may differentiate between the two.2 IVC thrombosis is uncommon, but when present, also occurs at the sites of anastomosis. 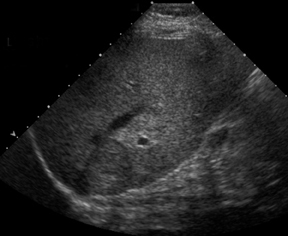 Grayscale will demonstrate isoechoic to echogenic intraluminal clot with color images demonstrating partial or absent venous flow.3 Additional secondary signs indicating IVC occlusion include ascites, hepatomegaly, edema, and pleural effusions.2,7 Full liver transplants require evaluation at the site of anastomosisas well as individual interrogation of the right, middle, and left hepatic veins. Normal hepatic venous waveforms demonstrate a triphasic pattern reflecting the various phases of the cardiac cycle. 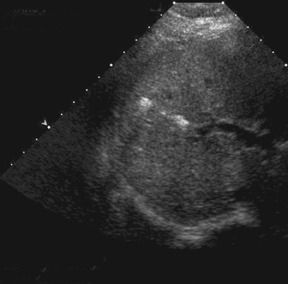 Similar to the IVC, loss of normal phasicity should prompt a search for a suprahepatic IVC narrowing. 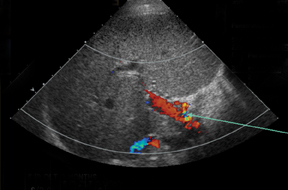 Approximately 15% to 25% of liver transplant recipients will experience a biliary complication, and usually within the first 3 months.3,7,8 While cholangiography remains the gold standard for diagnosing biliary complications, sonography is a vital screening tool. 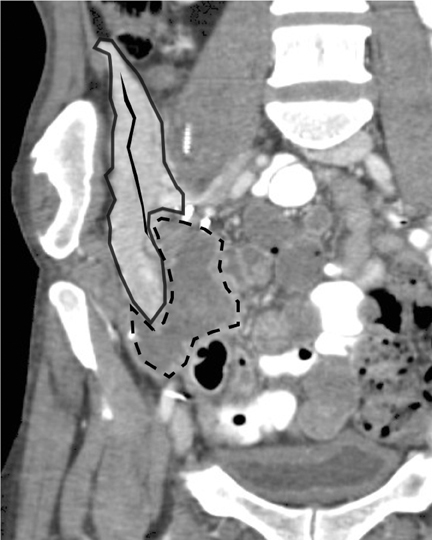 The gallbladder is removed during transplantation; however, it may be common to visualize a cystic duct remnant.3,8 The biliary anastomosisis usually performed in an end-to-end fashion connecting the donor common bile duct to the recipient common hepatic duct, a choledochocholedochostomy, in an attempt to preserve the functionality of the sphincter of Oddi, thus decreasing the risk of enteric reflux.6,7 In instances where the recipient’s common hepatic duct is diseased, absent, or too short, a choledochojejunostomy is performed.6-8 This is also the preferred biliary anastomosis in pediatric patients, in which case resultant pneumobilia is often present. 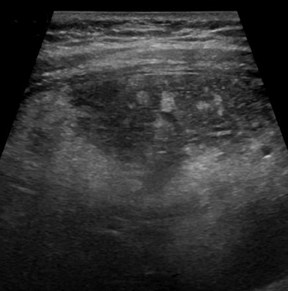 Bile leaks are the most common biliary complications and often present as peritransplant anechoic or hypoechoic fluid collections.8 Biliary strictures most often occur at the site of anastomosis.8 A common duct diameter measuring > 4 mm should raise high clinical concern for a downstream stricture, whether it be from ischemia, rejection, or infection.3 The biliary system in a transplanted liver is dependent purely on the arterial system for vascular supply.7,8 Therefore, areas of bile-duct strictures, dilatation (Figure 5), and leaks, especially remote from the anastomotic site, may indicate biliary ischemia and should prompt a careful survey of the hepatic artery, particularly at the anastomotic site.7,8 It is then imperative to focus the exam to uncover the underlying etiology resulting in the biliary abnormality. It is common to have several small peritransplant fluid collections or hematomas (Figure 6), which are expected to gradually shrink and resolve within days to weeks.7,8 A transient small right pleural effusion is also a common finding.7 Bilomas, lymphoceles, and abscesses are other considerations. Due to chronic immunosuppression of liver transplant recipients, posttransplantation lymphoproliferative disorder (PTLD), which is often associated with infection from Epstein-Barr virus (EBV), and non-Hodgkin’s lymphoma are becoming more common.3,7 Autoimmune hepatitis and Langerhans cell histiocytosis have been suggested as posing an increased risk of PTLD. The anatomic distribution of PTLDis related to the type of allograft itself. 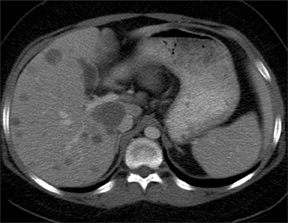 A common spectrum of findings in the liver is focal intraparenchymal masses (Figure 7), ill-defined infiltrative pattern and heterogeneous porta hepatis masses (Figure 8).12 Differential diagnoses for intrahepatic masses in a posttransplant recipient includes abscess, infarction, postsurgical hematoma or contusion, biloma, lymphoma, or carcinoma. Grayscale evaluation of the renal allograft should begin with size and position of the transplant within the abdomen. Due to its superficial location within the abdomen, fine detail may be more apparent than retroperitoneal native kidneys, such that visualization of cortico-medullary differentiation may be a normal finding. 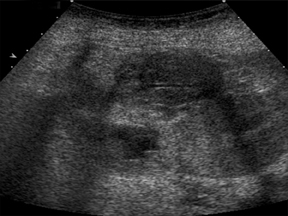 The most common location for the renal allograft is extraperitoneal in the right iliac fossa; however, intraperitoneal (pediatric patients)and contralateral transplants may also be encountered. Cadaveric transplants are often harvested with a portion of the donor aorta, which is anastomosed in an end-to-side fashion to the recipient’s external iliac artery.13 Living related donor transplants are often anastomosed in an end-to-side fashion, which ligates the donor main renal artery to the recipient external iliac artery or an end-to-end fashion to the recipient internal iliac artery (Figure 9). 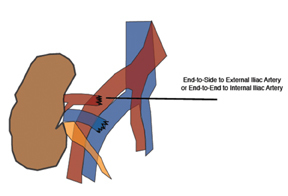 The venous anastomosis is usually an end-to-side connection between the donor main renal vein recipient external iliac vein. The donor ureter is often times implanted into the dome of the recipient bladder, uerteroneocystostomy.13 Variations of these surgical techniques exist in which it becomes important to consult with the surgical team. Peritransplant fluid collections are a common postoperative finding, reported in up to 50% of cases.13 The differential diagnosis includes hematoma, seroma, abscess, urinoma, or lymphocele.3 Hematomas and seromas usually present in the immediate postoperative period andare often sonolucent, although internal complexity is common in hematomas. 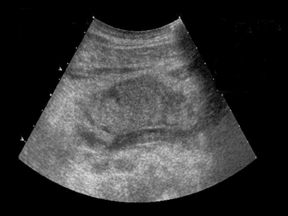 Abscesses usually occur within days 7-10, while lymphoceles develop within months.3,15 Urinomas are rare, but usually occur within the first few weeks and result from the breakdown of the ureterovesicular junction and may form near the bladder apex or cause an intraperitoneal leak.13,15 Regardless of the etiology of the fluid collection,it is important to discern whether there is significant interval increase in size or mass effect upon the allograft and if vascular compromise is evident warranting emergent interventional or surgical exploration and evacuation. 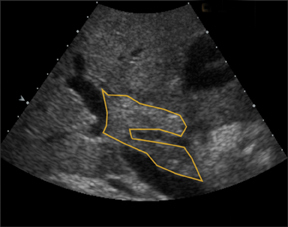 The diagnosis of allograft rejection on ultrasound is often an elusive one and may be deferred to the clinical history as well as a percutaneous biopsy. 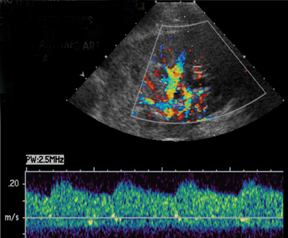 However, certain sonographic grading criteria exists in the attempt to elucidate the potential of transplant rejection based on grayscale and color Doppler findings, such as allograft swelling, loss of renal sinus fat, prominence of medullary pyramids, pelvi-infundibular wall thickening (Figure 15), and elevated resistive indices.17 In addition, Doppler analysis may reveal elevated resistive indices > 0.8, and sometimes even reversal of diastolic flow.13 These Doppler findings can also be seen in the setting of vascular thrombosis, acute tubular necrosis (ATN), and drug nephrotoxicity. Lack of arterial or venous flow will confirm the diagnosis of vascular thrombosis. ATN is common in the early postoperative period and almost exclusively occurs with cadaveric allografts. A differentiating feature from acute rejection is that ATN gradually resolves over the first few weeks, whereas acute rejection often peaks within the first 3 weeks of the postoperative period. Tissue sampling is necessary to distinguish between these 2 entities. 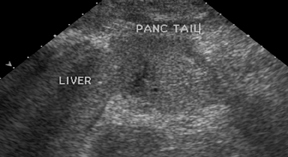 Sonographic evaluation of the pancreatic transplant begins with grayscale imaging of the allograft and is usually the first-line modality in the evaluation for clinically suspected graft dysfunction. The pancreatic allograft is typically placed in the extraperitoneal right iliac fossa and renal allograft placed in the extraperitoneal left iliac fossa for SPK (Figure 17). Prior to 1995, 90% of all pancreas transplants had pancreatic exocrine drainage via the bladder. Exocrine bladder drainage has the advantage of being able to follow urine amylase as a nonspecific rejection marker especially for solitary pancreatic transplants, PAK and PTA, where serum creatinine cannot be followed for rejection as in SPK. However, alkaline pancreatic excretions can result in metabolicacidosis in addition to urologic complications such as graft pancreatitis from reflux and urinary tract infections. The more physiological enteric pattern of exocrine drainage is currently the most commonly used whereby the allograft exocrine duct drains via an end-to-side or side-to-side anastomosis between donor duodenum and recipient jejunum. 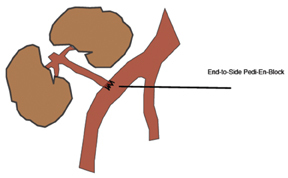 The arterial anastomosis involves creating a donor iliac Y-graft to the donor splenic and superior mesenteric arteries which are the anastomosed in an end-to-side fashion to the recipient right common iliac artery or external iliac artery (Figure 18). The most common cause of vascular-transplant dysfunction is vascular thrombosis, venous slightly greater than arterial.25-26 Clinically,patients may have hyperglycemia, graft pain, and hyperamylasemia. 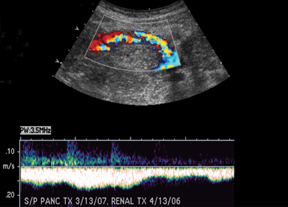 The blind-ending distal splenic and superior mesenteric stumps are prone to thrombosis, which necessitates careful documentation of patency or evaluation for extent of clot burden, since thrombosis is the most common cause for early graft failure.25 The lack or decrease of color flow, absence of appropriate spectral tracings, and visualization of echogenic intraluminal thrombus (Figure 20) lead to the diagnosis of vascular occlusion. 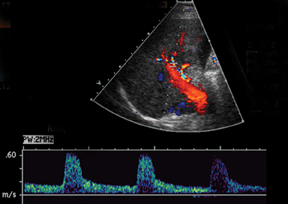 Reversal of diastolic flow in the pancreatic transplant arteries is highly specific for venous thrombosis.27 Venous clots can propagate to occlude draining vessels and can be treated with anticoagulation, catheter-directed pharmacologic thrombolysis/mechanical thrombectomy, or surgical thrombectomy. 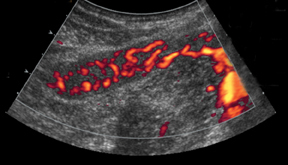 Slow flow in the splenic vein through the graft can cause a pseudothrombosis appearance. 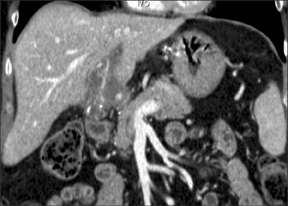 Recognition of this entity and further evaluation with Doppler or delayed contrast-enhanced CT can help avoid this pitfall.28 Short-segment peripheral thrombi can be seen and do not necessarily require treatment. Contrast-enhanced MRA has had some promising results for diagnosing vascular complications. However, the role of MRI may be limited as the pancreas transplant population with its high rate of concomitant renal morbidity is at risk for gadolinium-induced nephrogenic systemic fibrosis. 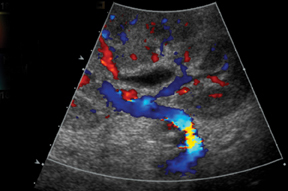 Additional vascular complications include anastomotic turbulent flow or elevated velocities indicative of stricture, pseudoaneurysm with swirling color pattern and turbulent to-and-fro spectral tracing, and postbiopsy arteriovenous fistulas. Postsurgical peritransplant fluid collections may represent hematomas, pseudocysts, abscesses, seromas, urinary leaks, ascites, or anastomotic leaks. These appear as anechoic or complex fluid collections. Long-term PTLD in pancreas transplants is associated with Epstein Barr virus infection and ranges from benign B-cell hyperplasia to malignant lymphoma. The incidence is highest in the first year and seen in up to 6% of patients from a series of 212 recipients.29 The greatest number affected were those who underwent solitary pancreas transplant, PAK or PTA, over SPK. Patients present with nonspecific symptoms, including malaise, fevers, chills, mild elevation of pancreatic enzymes, nausea, and vomiting. The findings of PTLD typically manifest in the allograft, either alone or with additional extra-allograft findings, and rarely extra-allograft only. PTLD may manifest as diffuse or focal allograft enlargement, extra-allograft lymphadenopathy, and rarely or ganomegaly.30 These findings are nonspecific as they can are also seen in rejection and overlap temporally in presentation. Interestingly, a late complication seen after 6 months is the development of periportal hepatic steatosis without steathohepatitis.34-35 Periportal echogenities (Figure 22) develop representing microvesicular fat and are seen on MR as signal drop off on opposed-phase imaging. It is thought to be a benign local effect of insulin from grafted islet cells and is not associated with graft dysfunction. Long-term immunosuppression afte rislet transplantation has also resulted in a significant percentage of premenopausal females (70%) developing sirolimus-associated ovarian cysts with a mean ovarian cyst size of 6 cm.36 Some of these cysts can be symptomatic leading to pelvic pain from torsion or rupture. Withdrawal of sirolimus results in regression of cyst size. As the number of abdominal transplants increases, knowledge of transplant anatomy and timely recognition of complications are imperative to increase transplant survival and decrease unnecessary procedures. Ultrasound remains the modality of choice in most institutions and determines the need for intervention or further evaluation with CT or MRI. US Department of Health and Human Resources. Organ procurement and transplantation network website. http://optn.transplant.hrsa.gov. Accessed December 20, 2011. Vaidya S, Dighe M, Kolokythas O, Dubinsky T. Liver transplantation: Vascular complications. Ultrasound Q. 2007;23:239-253. 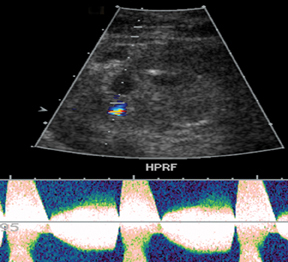 Little AF, Dodd G. Postoperative sonographic evaluation of the hepatic and renal transplant patient. Ultrasound Q. 1995;13:111-119. Wozney P, Zajko AB, Bron KM, et al. Vascular complications after liver transplantation: A 5 year experience. AJR Am J Roentgenol. 1986; 147: 657-663. 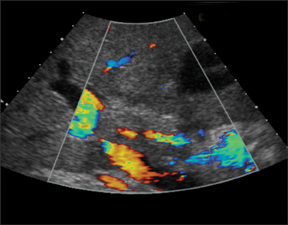 Flint EW, Sumkin JH, Zajko AB, Bowen A. Duplex sonography of hepatic artery thrombosis after liver transplantation. AJR Am J Roentgenol. 1988;151: 481-483. Brody M, Rodgers SK, Horrow MM. 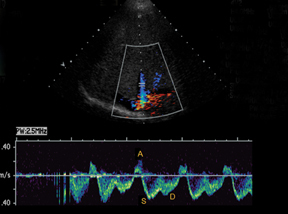 Spectrum of normal or near-normal sonographic findings after orthotopic liver transplantation. Ultrasound Q. 2008;24:257-265. Quiroga S, Sebastia MC, Margarit C, et al. 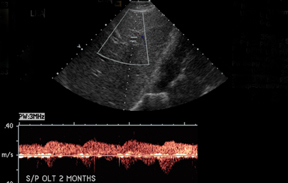 Complications of orthotopic liver transplantation: Spectrum of findings with helical CT. Radiographics. 2001;21:1085-1102. Nghiem HV, Tran K, Winter TC, et al. Imaging of complications in liver transplantation. Radiographics.1996;16:825-840. Chen W, Facciuto ME, Rocca JP, et al. 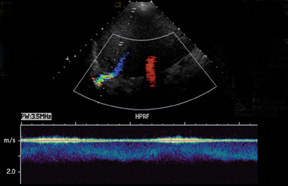 Doppler ultrasonographic findings on hepatic arterial vasospasm early after liver transplantation. J Ultrasound Med. 2006;25:631-638. Quiroga J, Colina I., Demetris AJ, et al. Cause and timing of first allograft failure in orthotopic liver transplantation: A study of 177 consecutive patients. Hepatology. 1991;14:1054-1062. 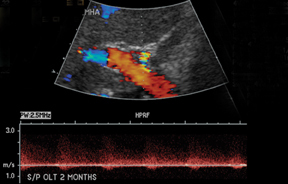 Shin D, Jeffrey R., Desser T. Pearls and pitfalls in hepatic ultrasonography. Ultrasound Q. 2010;26: 17-25. Borhani AA, Hosseinzadeh K, Almusa O, et al. Imaging of posttransplantation lymphoproliferative disorder after solid organ transplantation. Radiographics. 2009;29:981-1000. Park SB, Kim J., Cho KS. 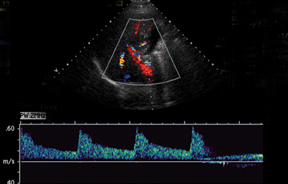 Complications of renal transplantation ultrasonographic evaluation. J Ultrasound Med. 2007;26:615-633. Bhayana S, Kuo YF, Madan P, et al. Pediatric en block kidney transplantation to adult recipients: More than suboptimal? Transplantation. 2010;90:248-254. Cosgrove DO, Chan KE. Renal transplants what ultrasound can and cannot do. Ultrasound Q. 2008;24:77-87. Gao J, Ng A, Shih G, et al. 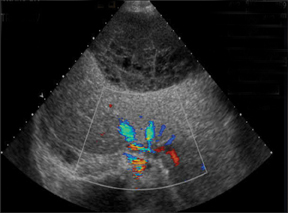 Intrarenal color duplex ultrasonography: A window to vascular complications of renal transplants. J Ultrasound Med. 2007;26:1403-1418. Townsend RR, Tomlanovich SJ, Goldstein RB, Filly R. Combined Doppler and morphologic sonographic evaluation of renal transplant rejection. J Ultrasound Med. 1990; 9:199-206. Gruessner AC. 2011 update on pancreas transplantation: Comprehensive trend of 25,000 cases followed up over the course of twenty-four years at the International Pancreas Transplant Registry (IPTR). Rev Diabet Stud. 2011; 8:6-16. Nikolaidis P, Amin RS, Hwang CM, et al. 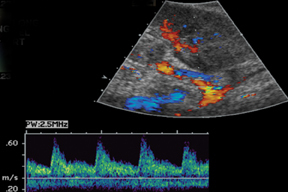 Role of sonography in pancreatic transplantation. Radiographics. 2003;23:939-949. Lo A, Stratta RJ, Hathaway DK, et al. Long term outcomes in simultaneous kidney-pancreas transplant recipients with portal-enteric versus systemic-bladder drainage. Transplant Proc. 2001;33:1684-1686. Han DJ, Sutherland DE. Pancreas transplantation. Gut Liver. 2010;4:450-465.
International pancreas transplant registry. http://www.med.umn.edu/iptr. Accessed November 15, 2011. Wong J, Krebs T, Klassen D, et al. 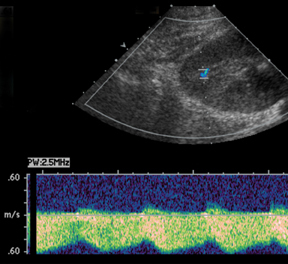 Sonographic evaluation of acute pancreatic transplant transplant rejection: Morphology-doppler analysis versus guided percutaneous biopsy. AJR Am J Roentgenol. 1996;166:803-807. Yuh WTC, Wiese JA, Abu-Yousef MM, et al. Transplant imaging. Radiology. 1988;167:679-683. Norman SP, Kommareddi M, Ojo AO, Luan FL. Early pancreas graft failure with inferior late clinical outcomes after simultaneous kidney-pancreas transplantation. Transplantation. 2011;92:796-801. Troppmann C, Gruessner AC, Benedetti E, et al. Vascular graft thrombosis after pancreatic transplantation: univariate and multivariate operative and nonoperative risk factor analysis. J Am Coll Surg. 1996;182:285-316. Foshager MC, Hedlund LJ, Troppmann C, et al. 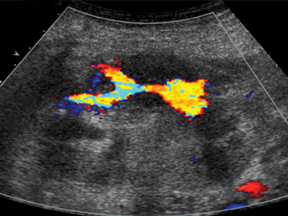 Venous thrombosis of pancreatic transplants: Diagnosis by duplex sonography. AJR Am J Roentgenol. 1997;169:1269-1273. 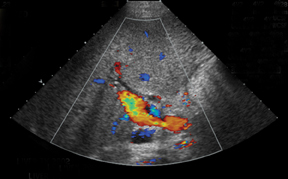 Gupta R, Rottenberg G, Taylor J. Pseudothrombosis of the iliac vein in patients following combined kidney and pancreas transplantation. Br J Radiol. 2002;75:692-694. Issa N, Amer H, Dean PG, et al. Posttransplant lymphoproliferative disorder following pancreas transplantation. Am J Transplant. 2009;9: 1894-1902. Meador TL, Krebs TL, Cheong JJ, et al. Imaging features of posttransplantation lymphoproliferative disorder in pancreas transplant recipients. AJR Am J Roentgenol. 2000;174:121-124. Collaborative islet transplant registry. http://www.citregistry.org. Accessed November 15, 2011. Shapiro AM, Lakey JR, Ryan EA, et al. Islet transplantation in seven patients with type I diabetes mellitus using a glucocorticoid-free immunosuppressive regimen. N Engl J Med. 2000;343: 230-238. Low G, Hussein N, Owen RJ, et al. Role of imaging in clinical islet transplantation. Radiographics. 2010;30:353-366. Markmann JF, Rosen M, Siegleman E, et al. Magnetic resonance-defined periportal steatosis following intraportal islet transplantation: A functional footprint of islet graft survival? Diabetes. 2003;52:1591-1594. Ryan EA, Lakey JR, Rajotte RV, et al. Clinical outcomes and insulin secretion after islet cell transplantation with the Edmonton protocol. Diabetes. 2001;50:710-719. Alfadhli E, Koh A, Albaker W, et al. High prevalence of ovarian cysts in premenopausal women receiving sirolimus and tacrolimus after clinical islet transplantation. Transpl Int. 2009;22:622–625. 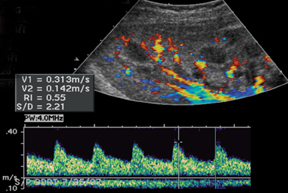 Sonographic evaluation of abdominal transplants: A practical approach. Appl Radiol. Dr. Shum, Dr. Kim, and Dr. Poder are in the Department of Radiology, University of California, San Francisco, CA.